"mac2cash.com" is a trading name of The Bookyard Ltd, Unit 18 The Matchworks, 140 Speke Road, Liverpool L19 2RF. Telephone 03456 800 256.
mac2cash.com only collect goods from UK mainland addresses. Since the submission of your machine for collection and purchase represents a legally binding contract, you must be 18 years or older to sell any device to mac2cash.com. You must be the legal owner of the goods being sold. Any goods found to be stolen, or any other fraudulent or criminal activity, will be reported to the relevant authorities. mac2cash.com logs user’s IP addresses and may block IP addresses from using the web site for quality control. If you are not happy for your IP address to be logged then you have the right to decline to use our service and website. Quotes generated by the mac2cash.com web site are calculated precisely based on the information submitted by the user and are only valid for goods with the serial number provided that arrive complete at mac2cash.com in the working & cosmetic condition, and with the accessories, selected by the sender when the machine was booked in online. Unless explicitly agreed by The Bookyard, all quotes generated by the mac2cash.com web site assume, and are only valid for, products that contain all their internal components (with the exception of generic hard disks retained for data security) and where these components are either the original components from that machine or are components that were fitted as part of a previous repair. Quotes are not valid for products assembled from faulty components from other products. The value quoted by the mac2cash.com web site for any given device may change over time and is only fixed when a quote is accepted by the user online whereupon the quote is valid for a period of 14 days. When a quote is accepted online, the quote value and declared information are recorded on our system, displayed on screen and emailed to the user at the email address submitted. mac2cash.com will not entertain any claims that the user was quoted a different value at the time the quote was accepted. It is the responsibility of the sender to check that the on-screen quote and the emailed confirmation offer the value they are expecting and to contact us prior to collection in the event that it does not. mac2cash.com is intended for submission of individual machines and online quotes are only valid for quantities or up to 5 of any one category of device (desktop, laptop, tablet, phone etc.) unless agreed with The Bookyard Ltd. For larger batches of devices, either contact us or visit our corporate IT asset disposal site macITAD.com. It is solely the responsibility of the sender to ensure that goods being sent to, or collected by mac2cash.com are packaged appropriately for courier handling and shipment. The manufacturer’s original shipping box with relevant inserts is generally the best container to package goods in and this should be considered the minimum acceptable standard of packaging and protection. Where the manufacturer’s original packaging is not available, a sturdy, double-wall box with no significant structural damage should be used. The box must be large enough to allow at least 4inches between the goods and the box on all side, bottom and top. All space must be filled with non-rigid packing material so that the goods cannot move within the box during transit. Ideally, bubble wrap or foam pellets should be used to fill voids but for lighter goods such as laptops, balls of newspaper will usually suffice. If you cannot find a suitable box or packaging, mac2cash.com can send one to you for a fee of £28.00 payable in advance, of which £20 is refundable once the goods arrive in the box. Please contact us to arrange. All flaps and open edges must be taped shut with packing/parcel tape so that the contents cannot easily be accessed en route. If you have questions or difficulties with the packing requirement, please call us. Collections can only be made Monday through Friday excluding bank holidays and national holidays. In rare cases, the courier may be unable to collect on the requested day at addresses in remote areas. The time of day cannot be specified for collections and it is the responsibility of the sender to ensure that the goods are ready to collect and someone is available to hand over the goods at the submitted collection address at all times between 9:00am and 5:30pm on the date requested by the sender. Collection attempts that fail due to there being no answer at the collection address, the goods not being ready to collect, or the goods not being packaged adequately as judged by the courier may incur a charge of £3.00 per failed collection at the discretion of The Bookyard. Fees incurred by failed collections will be deducted from any sum paid to the sender for the goods or charged to the sender in the event that no payment is due for the goods. mac2cash.com reserve the right to cancel any agreement after one or more failed collection attempts that are due to the sender. Since it is the sole responsibility of the sender to package the goods in an appropriate manner for shipment without damage (See section 1. ), neither mac2cash.com nor the courier will be held responsible or liable for any damage to the goods that occurs during shipping other than as stated below, and the condition of the goods received will be considered to be the condition when sent. Damaged goods will either be paid for at a suitable adjusted faulty rate, or returned to the sender in which a return shipping and administration fee of £15.00 will be payable in advance.. The only exception to the above conditions will be if the packaging is deemed appropriate by mac2cash.com and damage can be seen to be due to extreme mishandling in transit leading to damage to the packaging that would explain the damage to the contained goods. In this case mac2cash.com will pay the full quoted sum for the goods as if received without the in-transit damage. In the unlikely event that goods collected by the mac2cash.com courier service or handed to an authorised access point, can be shown to have been lost or stolen in transit, mac2cash.com will carry out initial checks with the courier to verify GSP locations of the collection, movement and weight data, and if in order, will pay the sender the sum originally quoted. The Bookyard accepts no liability for data loss in the event of a device being damaged, lost or stolen in transit. ADISA, the body that certfies and audits our IT asset disposal operations does not approve the use of couriers and therefore courier collection is offered as an option for customer convenience but is outside the scope of the ADISA Certification Program, and the user is required to accept during the booking process, full liability for any such data loss. On arrival, the goods will be immediately fully inspected and tested by a qualified mac2cash.com engineer to verify that the terms of the quote have been met (see section 2. Online Quotes above) and that the working condition, cosmetic condition and included accessories match those declared on the original quote. If there is no significant deviation from the declared information, payment will be authorised and sent via the chosen payment method. Any deviation from the declared information will immediately disqualify the transaction from any time commitments on the part of mac2cash.com. The sender will be notified immediately and the goods will be scheduled for a secondary, in-depth assessment from which a revised quote will be issued based on the received condition of the goods. The sender may then choose to accept the revised quote or elect to have the goods returned along with an engineering report for a minimum fee of £20.00 payable in advance to cover the inbound and outbound shipping costs plus up to £40 to cover the engineering time involved in inspection and testing (applied at the discretion of The Bookyard). Payment for fully working goods will be actioned within 1 working day from the time mac2cash.com receive the goods provided that the goods are as declared by the sender. Goods declared as faulty will take up to 1 additional working day to have payment actioned. mac2cash.com employ UPS to carry out it’s collections and shipments on a ‘next working day’ service meaning that payment will normally be actioned within 2 working days from the time of collection/drop-off, however, mac2cash.com shall not be held responsible for delays incurred by the courier. ‘Working days’ are defined as Monday through Friday excluding bank holidays and national holidays. Where the sender has requested payment by bank transfer or PayPal and supplied valid bank details or a valid email address, the actioning of payment will provide the sender with payment within 2 working days (48hrs) from the time collected or dropped off by the customer with the previously defined caveats. Where the sender has elected to be paid by cheque, the actioning of payment will be the point at which the cheque is prepared for postage by Royal Mail 1st class. mac2cash.com are not responsible for the time taken for Royal Mail to deliver the cheque and this delivery time is outside of any commitment of payment time. Any information, data, images, drawings, photographs, and/or other materials you transmit, submit or post to mac2cash.com will be considered non-confidential, non-proprietary ("Submitted Information") and of no commercial value. 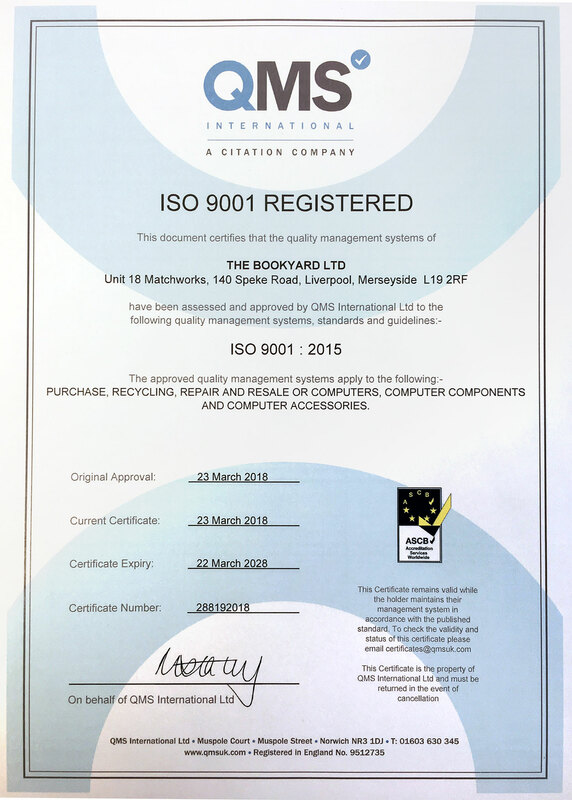 The Bookyard Ltd will securely destroy all submitted user data on all sent goods once payment has been approved. No submitted user data will be used by The Bookyard Ltd. or passed on to any third party. It is the sole responsibility of the sender to ensure that all data of value is backed up prior to collection or shipment and The Bookyard may not be held liable or responsible for submitted data deleted from supplied goods. To comply with our data protection regulations, in the event that an issue arrised and we are unable to make contact with the sender via the telphone number or email address supplied at the time of booking, we will securely erase all data on the device, or where the device cannot be erased due to a fault, we will physically destroy the hard disk, SSD or logic board containing any potential data. mac2cash.com reserves the right to cancel the agreement at any time, for any reason, with immediate effect. In the unlikely circumstances of this occurring after collection of goods, we will return the goods to the sender at no cost to the sender. The sender may cancel the agreement up until mac2cash.com have collected, or taken delivery of, the goods. If the goods have already been collected or dropped off at an Access Point then the sender must make an advance payment of £20 prior to the goods being returned to cover the shipping costs. In the event that there is an issue requiring us to contact the sender and we are unable to do so using the telephone number or email address supplied at the time of booking, the device will be held in storage for 6 months whereupon any payment for the device will be forfeit and the device will become the property of mac2cash.com.